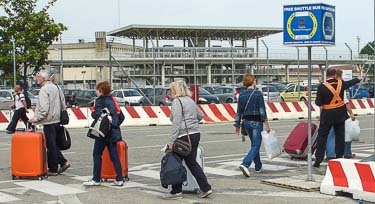 ABOVE: In this map ofthe Piazzale Roma (Venice's gateway for buses and taxis), the People Mover station is on the left. 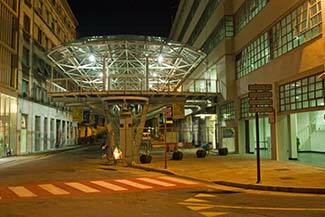 From this station, elevated trams run frequently to the Marittima cruise basin and the Tronchetto parking garage. 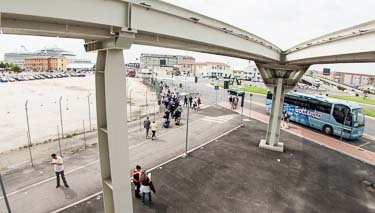 The People Mover's automated trains shuttle back and forth between the Piazzale Roma and the Tronchetto parking island, with an intermediate stop at the Marittima cruise port. 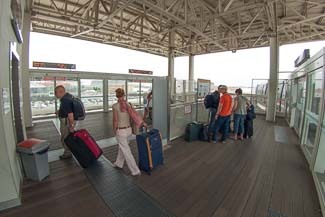 Travel time to Marittima is about one minute, and the modern stations are accessible to wheelchair users and passengers with heavy wheeled luggage. We've been covering the Venice People Mover since April, 2010, when we shot videos during the People Mover's first day of operation. 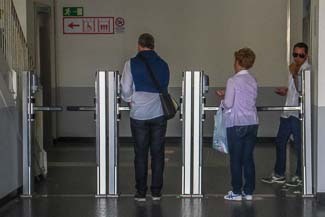 In this article, we're doing something different: We're providing step-by-step illustrated instructions for cruise passengers who want to get from the Piazzale Roma to their ships at Marittima without hiring taxis, paying for expensive cruise transfers, or relying on shuttle buses (which aren't always available). 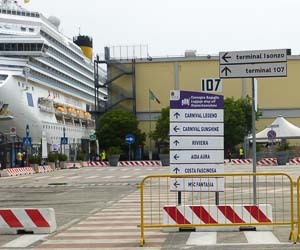 Not all cruise ships depart and arrive at Marittima. Small and medium-size ships often use the smaller San Basilio pier. 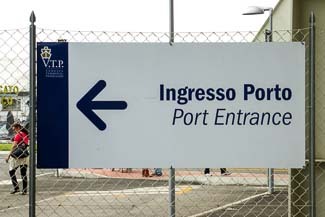 See our Venice Cruise Terminals article for more information, including a link to the port's official ship calendar. The People Mover runs from 7 a.m. until 11 p.m. on weekdays year-round. On Sundays and holidays, hours are 8 a.m. - 10 p.m. during the main cruise season (April through October) and 8:30 a.m. - 9:30 p.m. from November through March. 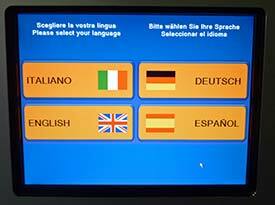 Buy a one-way ticket for €1,50 at the multilingual, easy-to-use vending machines inside the station entrance. The machines accept coins. banknotes of €5 to €20, and credit cards. Change is given in coins. The next train should arrive within a few minutes. 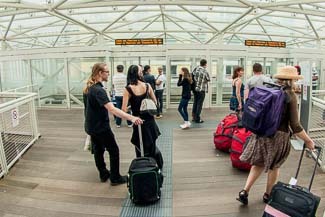 As you leave the People Mover station, a sign will direct you to the port entrance, which is only a short distance away.